You may have heard that you should avoid the stuff at all costs—but a recent study finds some amazing benefits linked to tuna consumption during pregnancy. Tuna has a complicated reputation when it comes to its effects on pregnant women. On the one hand, it's generally a very healthy food and pregnant women can certainly benefit from all those omega-3 fatty acids. But then again, tuna also contains more mercury than some other varieties of fish. Tuna's effect on a fetus's brain is particularly complex: Those omega-3s can strengthen a baby's brain development...but we've also heard that mercury can inflict brain damage on a fetus. What's a pregnant woman to do—heap her plate high with chicken of the sea or avoid it completely? According to the most recent research, eating fish during pregnancy can promote better brain health—and yes, that rings true for tuna as well. 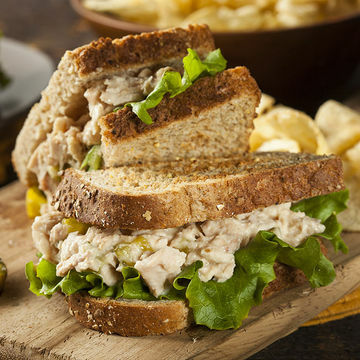 In fact, tuna may be among those seafood varieties that offers the best fetal brain benefits. The observational study was conducted in Spain and published in the American Journal of Epidemiology. Women in Spain reported information about their fish intake; the population eats quite a bit of seafood—women reportedly ate three servings of fish a week on average. The researchers tested the women sampled and their children thoroughly. During birth, they observed blood from the woman's umbilical cord. After birth, the children had their cognitive functions tested at both 14 months and five years of age. The findings indicate that more servings of seafood can boost cognitive function and offer a protective effect against symptoms of autism—and this effect isn't equal for all types of seafood. Consuming three or four servings of fish a week showed an IQ increase of about 2.8 points. Large, fatty varieties of fish—like tuna—showed the greatest protective effect. So yes, umbilical cord blood tests revealed higher levels of mercury and DHA in those who ate more fatty fish...but this might not be a bad thing. Researchers didn't find any negative link between brain function and mercury—in fact, if you want to boost your baby's brain power, a can of tuna might be your friend.